We Are the Water Garden Experts! 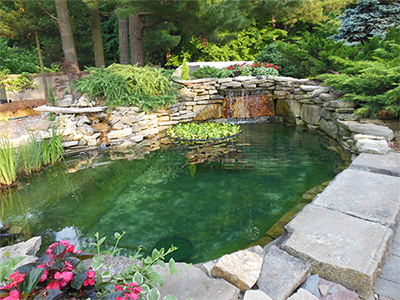 Having a problem with the water in your water garden, residential or commercial pond? Bring your water in for testing at no charge. If your pond is not crystal clear ~ it can be! We are experts in providing you with the knowledge you need to conquer any water garden or pond problem. Oak Park Landscape and Water Garden Center gives you everything for your water garden. During the season, we offer free water garden classes to help you get the knowledge you need to create that perfect water feature at your home. 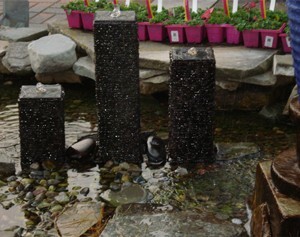 Oak Park Landscape and Water Garden Center provides you with the finest products available to build your own water garden. From tested, proven and safe pond liners to the finest in water pumps, including Pondmaster Pumps. We also offer everything to enhance your water feature including the stone, statues, fountains, fish and the finest array of water garden plants in the area. We also offer everything you need to build your own container water garden. Whether it be a large or small water garden, our knowledge makes your water gardening difference! Why not stop in and see our water garden displays for ideas (during the season).